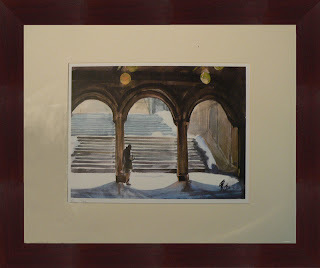 Currently I am working on a picture framing project. You're looking at a watercolor and two acrylic paintings. 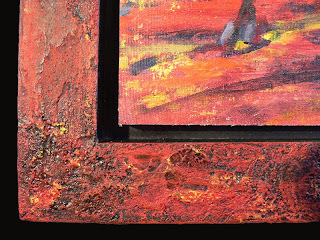 The two acrylics were purchased by the customer's kids in Spain from a street painter. 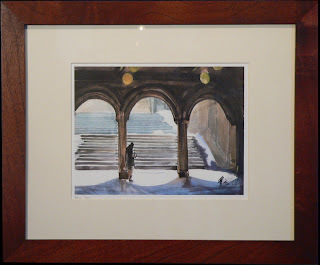 The watercolor, by the husband in New York. The frame I designed for the watercolor is pretty minimal, but it is being made of Mahogany, which has such a rich red color and a beautiful grain. Initially I was going to stain it darker, and finish it with a urethane, but yesterday when I assembled it I got the feeling that I should finish it with an oil. I don't have to do that much to it because it is so beautiful. 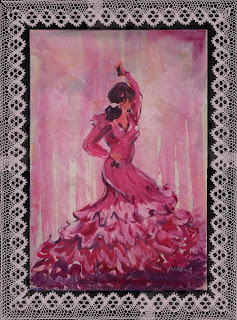 The acrylic painting of the flamenco dancer will be black with a gray stenciled lace design around it. 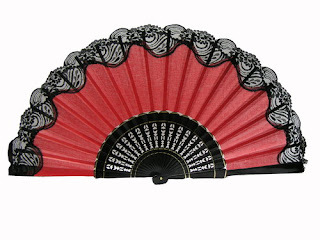 Flamenco dancers use these huge red fans, and I came upon an image of one that had gray and black lace on the tips. Right now I am experimenting with the lace to see how I can make a stencil out of it. The edges of the thin cloth are fuzzy and absorbent, they kind of fight the spray paint from taking the design. 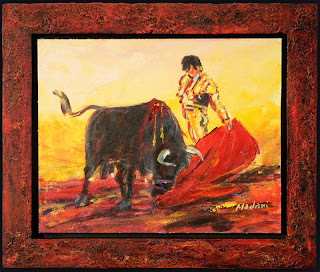 The Bull fighter frame is going to have a red and brown textured surface, and there is going to be a space between the mounted work and the frame. 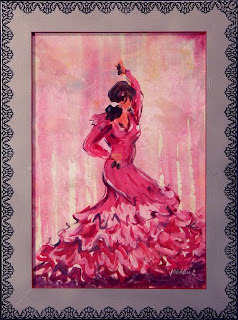 The spain pictures are the first artworks the kids bought, so I am trying to ornament the work in a way where that importance comes through. 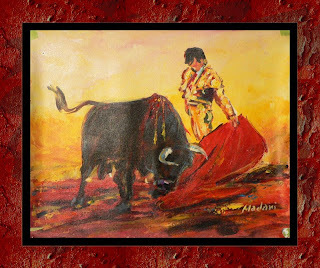 The textured surface is like the dirt flying up from the bull, and the lace ties into the dress and fan. 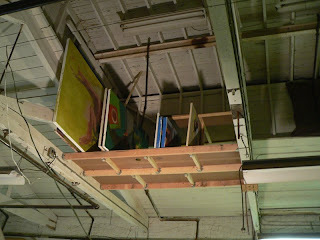 I built most of the frames yesterday, and I will take images of the finished work. 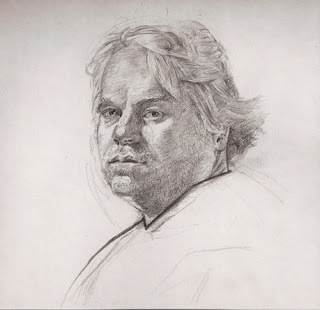 Portrait of Philip Seymor Hoffman. 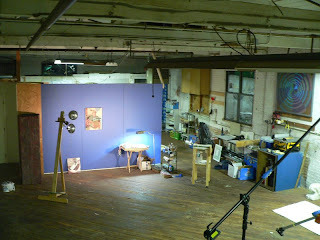 Here are images of the work that I have done so far. 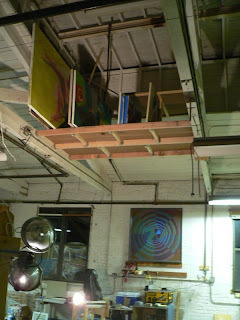 The first image gives you a general idea of how the space has changed, and I included some photos of the rafters that I built for storage and a current painting. I had never heard of joist hangers a week ago, but I have found a new best friend. I am leaning toward "Enjoy the music while you wait" for the painting, it is inspired by mistakingly putting toothpaste in my contact, and a drawing I did right after while listening to Mad World by Gary Jules in the background by one of my dad's students. I haven't made up my mind with the title, maybe one of you passing bloggers could suggest something to ponder. 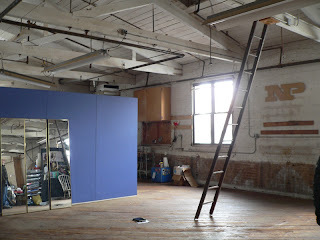 New Prospect Park Studio, day of signing the lease. 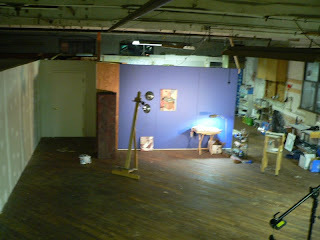 Before I moved in all my stuff. 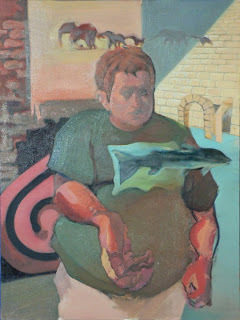 Self-Portraiture has been an interest of mine since I was very little. There is a lot of guilt and shame involved spending so much time in front of the mirror looking at yourself - it seems vain. However, I came across this comment by Raymond J Steiner on the self-portraits made by Burton Silverman. I feel that it pin points a very specific reason for my own interest in the subject. The challenge to be objective and subjective at the same time, within your mind, while creating an image of yourself is a powerful experience. A self-portrait can be a lasting impression of a series of moments, and it is gratifying to be able to steady your head enough to wield what you are seeing and feeling in that time.